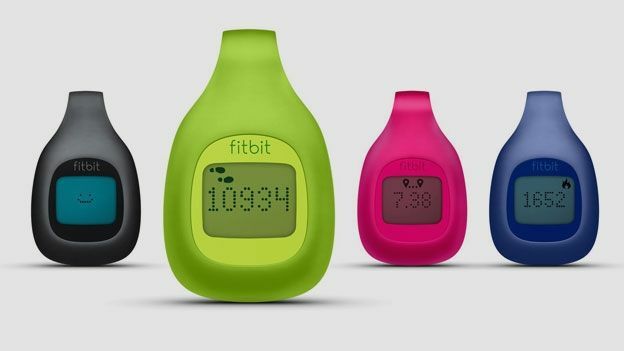 After the Fitbit Ultra arrived in the UK last year, the wireless fitness tracker has been updated to the Fitbit One, but it now comes in a more wallet-friendly version in the shape of the Fitbit Zip. With hopes of bringing a more youthful appeal, the Zip has stripped away some of the features of the Ultra but essentially has the same goals - to get you fighting fit. The Zip is the total opposite of the Ultra in terms of looks, opting this time for a small pod-shaped body that instantly brings back memories of a Tamagotchi. The button-less tracker with a dot matrix display sits inside a rain and water-proof rubbery shell that comes in a host of bright colours including white, blue, magenta and blue. Of course, while the Nike Fuelband is quite a stylish fitness tracker to show off, there are some who like to be more discreet about the monitoring so the Zip can be worn on the waist of your trousers, clipped onto a shirt or simply kept inside your pocket. One of our main criticisms of the Fitbit Ultra was that it had a tendency to be less secure when clipped onto different materials, but with a clamp-like grip the Zip does not budge so you should have little worry of it flying off during the day. There are no buttons on the Zip instead opting for simple taps on the screen to view information, which includes viewing the time, amount of steps walked (daily), total distance covered in miles, calories burnt, and a Fitbit smiley that illustrates how fit you are staying with a smile or a frown. Disappointingly, the Zip misses out on the sleep monitor and altimeter features included in the Ultra which made the tracking monitor a more attractive option compared to other tracking devices. A small USB Bluetooth receiver means you can wirelessly sync information when you are in 20ft range back to your computer, while Bluetooth 4.0 and Bluetooth smart ready support means you can also send the information via iPhone 4S, iPhone 5 and new iPad 4 to the Fitbit web tool. There's no charging to do, with a watch battery powering the device, which has its positives and negatives. The positives being that it is another device you don't constantly have to keep powered, but it does mean you will need to replace the battery in around six months. The good news is that when inactive, the power is not used. Having already synced one Fitbit device to an account, it was a relatively easy process to swap it for another device, however it would have been nice to have the option to keep more than one Fitbit assigned in a similar way that Nike does for its Nike+ products. One of the most impressive features of Fitbit is the app integration and having used the Fitbit Daemon app to sync Nike+ runs, the support simply carried over to the Zip making it a seamless transition. The real value is in the web and app analysis tools both of which have been refined and updated since it was first launched in the UK in 2011. In the web tool you can manually enter exercise when you cannot wear the Zip (if you are swimming for instance) to make sure all activity is covered showing you how many additional calories you have burned. There's also the all-important food tracker that now let's you see your daily calorie estimate, calories burned and how many you have left to consume for the day. Much of this added functionality has been included in the iOS smartphone app, which had previously been a more scaled-down version of the desktop tool, but we are hoping that this will soon be added to Android and possibly Windows Phone 8 versions as well. The Fitbit Zip misses out on some of the nicer features found on the Ultra and lacks a great display while we would worry about instantly losing the Bluetooth USB receiver, but if you are looking for an affordable way to track a healthier lifestyle and don't want to shout about it, the Fitbit Zip is a good option. If you are after more functionality, you will probably want to invest in the Fitbit One.